Having heard some more fanfares on your British show ... wondering ... why organ "trumpets" almost always are a loud reed. Sort of like God's own Oboe with an edge. I guess real trumpets are reeds, too, with the players lips standing in for something mechanical, but that produces a very different sound. IIRC, the Wanamaker has a fairly real sound trumpet, but most other trumpet stops don't. They're loud, but sound kind of "pinched" - except for those classic old Spanish and southern French concoctions, which sound good regardless. What might be kind of interesting would be to add a digital trumpet stop, perhaps with samples from somebody doing jazz trumpet - Marsalis or Armstrong records? Hmmm...what might an organ Trumpet be if not a loud reed? 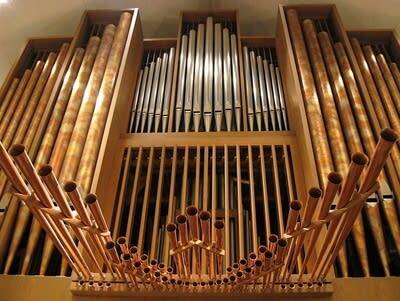 Organ reed pipes sound the way they do because that's the way they sound. Keep in mind that these sorts of pipes were first developed back @1450, when actual trumpets probably sounded similarly thin. I imagine that the 'classic' organ trumpet pipe continues in this line as a matter of tradition, though later 19th and early 20th century builders (particularly the English) did evolve rounder sounding 'tuba' stops. I would not much like to hear a digital trumpet 'stop' attempt to sound like Marsalis or Armstrong. However, any of the recordings by Dan Bellomy might come close. He uses the Wurlitzer Posthorn as though it were a jazz man's axe.